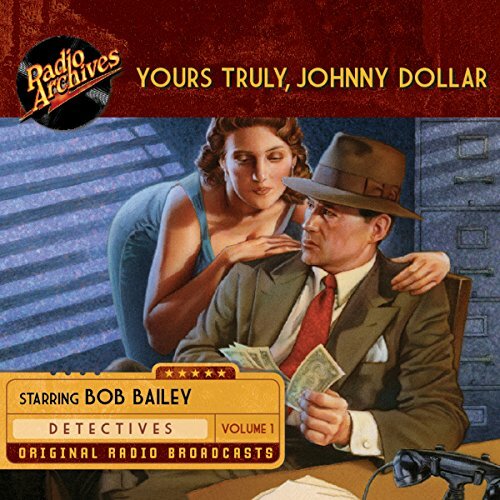 Yours Truly, Johnny Dollar began in 1949 as a typical slam-bang detective series, and though consistently well written and acted, the series never really captured an enthusiastic audience. However, in the fall of 1955, Bob Bailey took over the title role; veteran director Jack Johnstone and writers John Dawson, Robert Ryf, and Les Crutchfield joined the production team; and the series was transformed into a quarter-hour, five-a-week strip show. The result was a rebirth for America's favorite freelance insurance investigator as Bailey assumed the role of a lifetime, the writers had the chance to develop the depth of the stories, and the new cliffhanging nature of the series made radio's dwindling listening audience want to tune in day after day. Everything about it was top notch EXCEPT the repeating commercial for the children's toys. Bob Bailey was the best guy in the best series; it was a perfect storm. every story captures your attention from beginning to end. it's as if you were living the story. I was a Philip Marlowe listener when I discovered Johnny Dollar, and now couldn’t go back. Marlowe was a pretty two-dimensional hard-boiled cliche, whereas Dollar can get tough when he needs to be, but has an endearing charm when he doesn’t. With great production values, YTJD is about as good as it gets. Helps me stay up working the graveyard shift. Loved the thrills and twisted plots in the stories. I enjoyed this presentation and look forward to seeing the complete set with in the next week or so. I very much enjoyed this series and the collection was compiled well. I would have preferred if the adds were cut since the 78 times I listened to the inflatable holiday toys promotion is seared into my mind forever. Also the misogyny got a bit grating but we had fun stipulating about how the evil vaginas led to insurance fraud but all together it was a great show to fall asleep with. Johnny Dollar is a great series. A couple of the later later stories in this series have a ton of adds. The first time you hear it, its kind of cool as it is a vintage add. But the adds/intro's literally take up as much time as the story on a couple of them. The adds/intro's probably take up an hour or more of the time on this recording.